Prime Minister Narendra Modi is likely to re-shuffle his Cabinet on Sunday before leaving for China to attend BRICS summit, said sources. 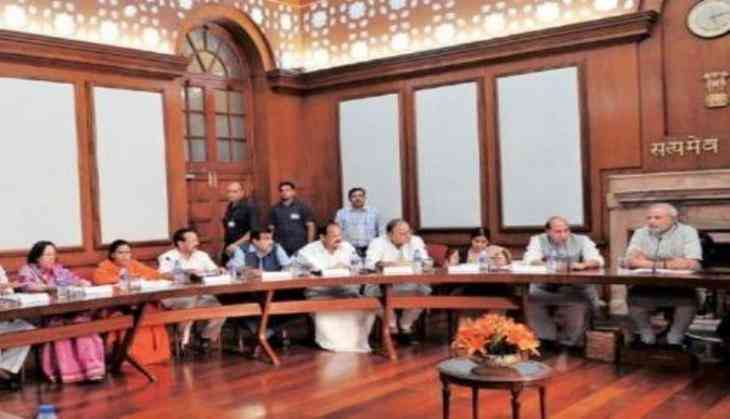 Earlier in the day, the newly appointed Uttar Pradesh Bharatiya Janata Party (BJP) president Mahendra Nath Pandey has hinted at his stepping down as the minister of state for human resource development, ahead of the reshuffle in the union council of ministers. Speaking to ANI, the Uttar Pradesh BJP chief said that he has already conveyed about his resignation to BJP President Amit Shah and will soon be talking to Prime Minister Narendra Modi on the same. "I have to tender my resignation as the state Union Minister, as Uttar Pradesh is a huge state and there are lots of responsibilities," Pandey said, adding that he will be meeting Prime Minister Modi regarding this. Minister of State Skill Development and Entrepreneurship Rajiv Pratap Rudy has resigned from Prime Minister Narendra Modi's Cabinet yesterday. Earlier, Mahendra Nath Pandey thanked Prime Minister Narendra Modi and party chief Amit Shah for giving him an opportunity to serve the people of the state as the new Uttar Pradesh Bharatiya Janata Party (BJP) president. Pandey is a BJP MP from Chandauli constituency. Pandey has replaced Uttar Pradesh Deputy Chief Minister Keshav Prasad Maurya who was serving as UP BJP chief. The decision to appoint a new chief has come forth as Maurya is expected to be elected to the Legislative Council to continue as Deputy Chief Minister of UP.